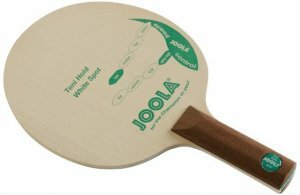 Home Table Tennis Blades JOOLA Toni Hold White Spot = famous defensive blade! This defensive blade - for years manufactured without any changes - provides total control through the soft and elastic poplar veneers. Ideal in combination with anti-spin (like Joola Amy) or pimple rubbers (like Joola Badman).